One of the most beautiful and mysterious gems - pearls - associated with many contradictory signs, then advising it as a gift, on the contrary, forbidding to give pearl jewelry. Mystical properties were ascribed to pearls since ancient times. It was believed that it improves health, and improves skin tone and even neutralize poisons. The jewel in the Cup of wine protected the drinker from intoxication, are frequent in the Middle ages methods of killing. However, not existed (and still exists) certainty on the question whether or not to give the pearls. Too seemed mysterious ancestors, this stone is born in the depths of the earth, and the living entity. Astrologers claim that the pearl is ideal for those born under the sign of Pisces, and it is recommended to wear girls and women as a sign of purity and innocence. With this symbolism is connected and the mandatory presence of pearls in wedding attire brides in many countries. In ancient Greece there was even a custom of symbolically linked Bridal necklace of pearls, reminding us of fidelity. At the same time, the signs state that the pearl - "stone of tears", and get it as a gift to crying and frustration. However, most of these signs relate to the dreams: when we sleep, give, find, or get pearl to tears. As for the real world, here is a little secret: a stone of love and loyalty - pearls - always reaching for the pair, so it is better to give pearl jewelry pair set, for example, necklace and bracelet. Mostly pearls give a young bride to the wedding, but, according to popular belief, pearls provides help in business matters, protecting its owner from unfair transactions and helping to establish contacts. 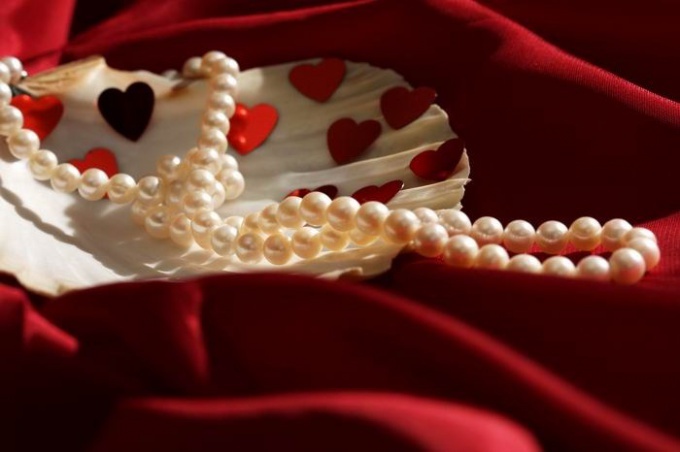 To give pearls - it is possible and necessary, that no other stone symbolizes purity and the beauty of the soul, improves health, and, of course, brings joy. One of the best ways to determine real pearl or faux - hold it against the teeth, while natural pearls are unlike copies will squeak. If you happen to receive a gift of pearl jewelry, wear it as often as possible - without the heat of human body gems fade and lose their beauty and brilliance.